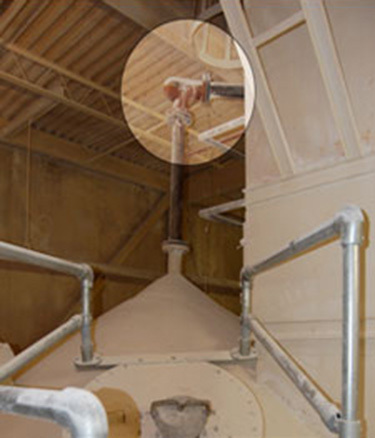 This 90-degree Smart Elbow deflection elbow from HammerTek, Bethlehem, Pa., diverts the pebble lime in the pneumatic conveying line into a silo for storage. The sharp turn that had tormented many different types of elbows has not been a concern for the Smart Elbow deflection elbow, nor for facility management. 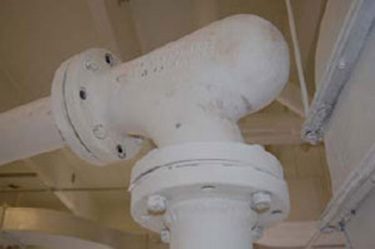 This sweep elbow is one of many that failed to handle the abrasive pebble lime used in the treatment process at the upper Occoquan Water Reclamation plant in Centreville, VA. Such elbow failures, which caked the facility with lime dust as shown on the floor, were plaguing the facility. This HammerLoy™ Series Smart Elbow deflection elbow from HammerTek, Bethlehem, PA, is one of 14 such elbows installed at the upper Occoquan Water Reclamation Plant in Centreville, Va. To eliminate pipe failures in the conveying line. After more than four years in operation, all of the Smart Elbow deflection elbows continue to perform as specified without a single pipe failure. Robert Forgione, P.E. and his team at the Upper Occoquan Water Reclamation Plant in Centreville, Virginia were wading through yet another dust cloud to cleanup yet another pile of dry pebble lime and dust that had leaked from a failed elbow in the conveying line. While the hole measured a mere 1/2-inch across, it was large enough to spew the abrasive powder billowing all over the building until the high pressure conveying system could be shut down. The elbow failure created a hazardous slip and fall situation, threatened acceptable air quality levels, and put sensitive electronic controls at risk. 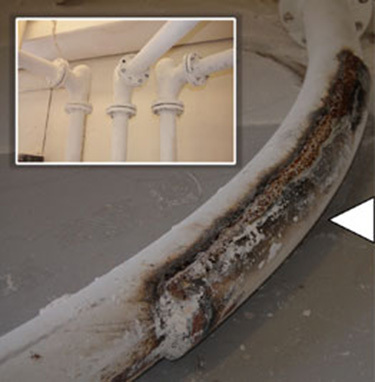 Although it would be feasible to recover from a single leak like this one, Forgione was responsible for elbows that failed and leaked every six months. "We had to fix this situation," said Forgione, the director of the operations and maintenance division for the Upper Occoquan Sewage Authority (UOSA). The wastewater treatment plant handles upwards of 30 million gallons per day and provides potable water to more than 300,000 people in portions of Fairfax and Prince William Counties. Its chemical treatment system relies on a non-stop supply of pebble lime for raising the pH to levels where bacteria and phosphorous can be efficiently removed. After off-loading, the lime was pneumatically conveyed up to six silos but transporting this huge volume of abrasive material with three to four percent grit at high velocities proved far too demanding for every type of elbow Forgione and his mechanics and engineers could find. Schedule 80 steel sweep elbows had worn through in a few months. So did the short radius welded steel elbows. And, so did similar long radius steel elbows. Ductile iron piping and elbows lasted nearly a year. Then longer 10-foot radius steel sweep elbows were installed. They lasted for a year and a half. None worked. Every time there was a failure, the line had to be shut down and its silo taken offline. Inspecting elbows became a daily ritual while maintenance personnel became expert at welding temporary patches to keep the 17 elbows intact. Eventually, these would also wear beyond repair and each time an elbow had to be replaced, it consumed hours, along with the expense. "It's very difficult for us to replace an elbow," said Forgione. "Not technically, but the elbows at ground level are not easily accessed and the ones on top of the silos are four stories up. It's a safety concern as well as a cost concern." Meanwhile, operations personnel were being diverted from their more formal responsibilities to help with the cleanups. "We needed to make the elbows last longer and we needed it done fast," said Forgione. "As far as the type of elbow or material, we'd hit a brick wall." Then Forgione came across the Smart Elbow deflection elbow from HammerTek Corp., Bethlehem, PA. A completely different approach, the Smart Elbow product has been installed in some of the world's largest facilities that handle highly abrasive materials such as ceramics, plastics, grains, and minerals — all without fail. The Smart Elbow deflection elbow had been installed at a wastewater treatment plant in Alexandria, Va. to solve an identical lime handling problem. Under Forgione's direction, UOSA Process Control Engineer Ivan Romero and Mechanical Manager Larry Brown toured the facility. "They were very happy and hadn't had a single blowout since installing the Smart Elbow model," Romero said, also noting the cleanliness of their facility. "You could see they weren't having any of the problems with leaks that we were having." The Smart Elbow design is based on the natural flow patterns of fluids. It combines a rounded chamber on a tight radius elbow in a single, rugged unit. The conveyed particles gather and swirl inside the chamber in a slowly-rotating, self-renewing ball, absorbing new material while gradually releasing it in a first-in, first-out progression. Incoming particles deflect off of this rotating ball of air and material and continue to the silo. Rather than inviting the material to collide with the elbow wall, this elbow virtually eliminates such wearing impact, instead causing gentle deflections that promote directional change without affecting system pressure. This HammerLoy™ Series Smart Elbow model from HammerTek, Bethlehem, PA., is one of 14 such elbows installed at the Upper Occoquan Water Reclamation Plant in Centreville, Va. to eliminate pipe failures in the conveying line. After more than four years in operation, all of the Smart Elbow units continue to perform as specified without a single pipe failure. Forgione tested Smart Elbow deflection elbows and after more than a year without any signs of wear, let alone a leak or blowout, he replaced all of the elbows at his second installation. With assistance in specifying the elbows from Joe Cathey of Cathey Prosolutions, Sykesville, Md. — who had originally specified the Smart Elbow deflection elbows in the Alexandria facility — five 45-degree, four-inch elbows were installed where the trucks off-load their lime and nine 90-degree, four-inch elbows were installed at the tops of the silos. With careful consideration of the characteristics of the lime, the length and velocity of the pneumatic conveying system and other factors, Cathey recommended the HammerLoy Series Smart Elbow deflection models, which feature a custom alloy with impressive hardness proven in handling abrasives. "This is what we specified in Alexandria and it has performed as anticipated," Cathey said. Six years have gone by since installation there and none of them has needed to be replaced. Similarly, four years have elapsed since their installation at Forgione's UOSA facilities and there hasn't been a single blowout. "With the Smart Elbow deflection elbow, we've eliminated the primary source of lime dust along with the hazardous conditions it creates," Forgione said. Maintenance and labor costs have been reduced, safety and air quality have been upgraded, the building is visibly cleaner and according to Romero, management is enjoying some well-earned peace of mind. "As an engineer, it doesn't matter what I think, what matters are results," Romero said. "The fact is, the Smart Elbow product is working, we're happy with it and I would recommend it to anyone involved in handling lime." Forgione added, "Our experience with HammerTek has been excellent, the delivery was fast and our mechanics were able to install it pretty quickly without any complaints. If we ever get wear in an elbow anywhere in the plant, we'll replace it with the Smart Elbow deflection elbow." "As an engineer, it doesn’t matter what I think, what matters are results. The fact is, the Smart Elbow deflection elbow is working; we’re happy with it, and I would recommend it to anyone involved in handling lime." Ivan Romero, Process Control Engineer.